The condo boom our big cities are currently experiencing is resulting in a huge number of small but trendy apartments with one huge problem: with sizes even as small as 300 sq-ft, these apartments lack badly adequate storage space. The buyers of these units have to be inventive and able to adapt to the limited spaces without causing clutter and mess. After all, they paid huge prices for their condos, and they want to keep them attractive and trendy looking. And the less clutter there is, the bigger the apartment looks. So they need storage solutions that will make the apartment look more spacious without taking anything away for the trendy looks. Well, storage solutions that make use of baskets and benches might just be what they need! 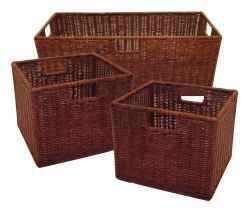 Stylish storage baskets can be placed on shelves or inside the compartments of cabinets, closets, or shelving systems. At the same time, benches with built-in storage can be used as part of the sitting and lounging furniture to create more storage without taking extra space in the living rooms. One could even combine these solutions placing baskets inside a storage bench (as shown in the top left picture). We will present here some of the best and most popular baskets, basket cabinets and storage benches available that can be used to create attractive storage spaces as attested by numerous Amazon customers and reviewers. Baskets are the most versatile of all storage objects. They can be used as stand alone on counters, tables or floors, inside closets or cabinets, and even under benches as shown in the top left picture. They can store whatever you want, can be hidden away or exposed, and they help organize your stuff. When they are nicely designed, like the Winsome Wood Leo Storage Baskets shown in the picture, they are very suitable to be used as cabinet compartments. The Winsome Wood Leo Storage Baskets are made of wicker with metal frames for extra strength.They are sturdy, roomy, elegant, and they nicely integrate into any decor. They have spacious handle holes for transporting and come in walnut and espresso colors. The following pictures show these elegant baskets being used as compartments inside Winsome Wood Milan Wood Cabinets. As can be seen, multiple configurations that respond to all types of storage needs are offered. Please click the selected product to check the exact price or to purchase. 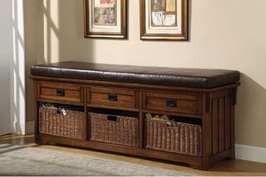 A storage bench is a piece of furniture that offers both seating and storage space. These benches come in all styles, sizes and materials. One can find beautifully made storage benches that integrate nicely with the home decor. They can be placed in dining rooms along the dining table, in living rooms to complement the decor and provide more sitting space, in bedrooms usually at the feet of the bed, and anywhere else one may wish. Depending on the bench style, they may have drawers, under the seat storage space, or compartments that can be fitted with storage baskets. The following photo gallery shows various styles of storage benches. Note that a good selection of storage benches is available further down in the Amazon products sections.